If you have any questions not covered in this FAQ section, please get in touch via the Contact page with your query and I’ll get back to you as soon as I can with an answer. Your ring should fit your finger comfortably. It should be a snug fit that is not too loose to fall off, but loose enough to slide over your knuckle easily. When measuring your finger to determine your ring size, please bear in mind that finger sizes change depending on certain factors. Temperature, humidity and excercise can all temporarily alter your finger size. Don’t measure your fingers after showering or being outdoors in cold weather. For the best fit, measure your fingers at normal room temperature, towards the end of the day. If you have prominant finger joints, then please take these into account when taking your measurements. For women, please bear in mind that your menstrual cycle can also affect your finger size slightly or dramatically due to water retention. If you have seen one of my Antique Silverware Rings at a shop or gallery owned by one of my many stockists around the UK and it’s the wrong size, you can ask the stockist to get in touch with me about sizing. If I have the same design in stock at Milomade HQ, I can make a new ring to order to your required size and deliver it to the stockist within 7 days. If I no longer have the same design in stock I can re-size the ring you’ve seen and tried on if it’s sent back to Milomade HQ. You will need to arrange purchase with the stockist and take into account that there is a charge of £15 for re-sizing an exisiting ring and you or the Stockist need to cover the cost of delivery to me. I can re-size the ring and post it back to either yourself or the stockist within 7 days and I will cover the cost of re-delivery. An invoice will be sent via email to the stockist, or yourself, once I have received the ring and this needs to be paid in full before the re-sized ring is dispatched. Precious metals are rarely used in their purest form but are usually alloyed with other metals for workability, durability, wearability. It isn’t possible to detect an article’s precious metal content by sight or touch. Therefore, it is a legal requirement for an Assay Office to hallmark articles containing precious metals if they are described as such and these hallmarks indicate the amount of pure metal in the alloy. There are four Assay Offices in the UK (London, Birmingham, Sheffield, Edinburgh). All four Assay Offices have a legislative remit to control standards of precious metal being sold in the UK. They do this by assaying (testing) the precious metal content, then applying the appropriate hallmark. It’s a legal requirement for silver over 7.78g, gold and palladium over 1g, and platinum over 0.5g to have a UK recognised hallmark. 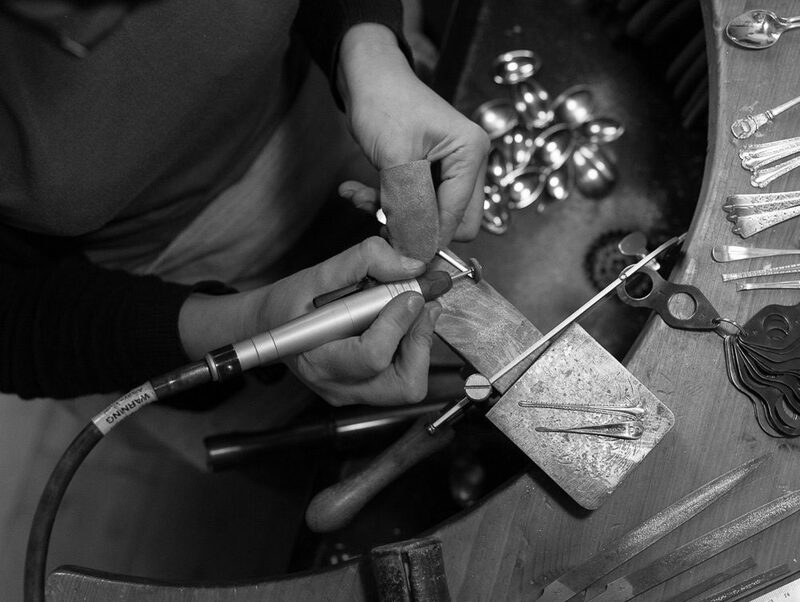 If not worn regularly or stored correctly, over time sterling silver jewellery will naturally tarnish. The majority of Milomade jewellery has an oxidised finish – meaning that the silver has been blackened through a chemical finishing process. This oxidisation can also change and fade over time. Store your jewellery pieces separately, so that they don’t rub & scratch against each other, ideally in the packaging provided or in a ziplock bag. Take particular care with cable necklets as they are easily kinked and bent. Store jewellery in a cool, dry and safe place away from direct sunlight, heat and humidity. Remove jewellery when undertaking physical activities as your sweat can change the appearance of silver. It’s also advisable not to wear your jewellery whilst swimming (pool or sea) or taking a shower or bath. Apply your hair or skin products before you put on your jewellery as perfume and cosmetic products can react with the metal surface and cause silver to tarnish. Do not wear your jewellery overnight. A silver dip solution is not recommended for cleaning Milomade jewellery as this strips away any oxidisation applied to the piece intentionally. I enclose a small jewellery polishing cloth with each jewellery sale on this website and this can be used to buff and shine the raised surfaces of your jewellery to remove tarnish and retain the intentional oxidisation. This type of finish on silver can often become shiny with wear. You can easily re-apply this delicate texture yourself by using an abrasive kitchen pad in a gentle circular motion. Do not be too scared of damaging the silver surface, it is tougher than you think! If your jewellery gets damaged by accident or due to negligent handling, get in touch as I will be happy to provide a repair quote.